Learn What the ISP Insiders Told Us! Message Systems and SparkPost hosted a panel of Internet Service Providers to get up close and personal with the teams that manage ISP policies and best practices. This is what they told us they really want senders to understand. 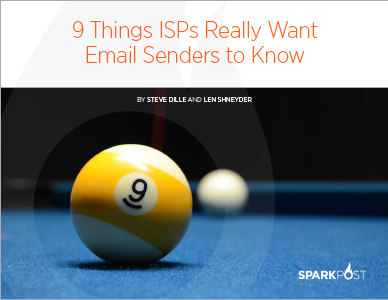 In this guide, you’ll get 9 actionable tips to help improve your deliverability and customer engagement, protect and improve your sender reputation, and maintain good relations with your ISP and inbox providers.